Agora Financial is an independent financial forecast team that sells many different financial newsletters, which basically just give advice on different investments, market alerts, financial loopholes, and so on. But is Agora Financial a scam? Will the financial advice given live up to all the hype of the products sold? Or are the over-the-top sales pitches that you commonly hear for products that are published by Agora Financial hollow and unbacked? One thing is for sure, there are a heck of a lot of complaints on this company. I’m guessing you are probably already aware of this which is why you are wondering if they are a scam. In this review I will be addressing some of the major complaints against the company and giving my opinion on whether or not it’s all just a scam or if their financial forecasts really do work. 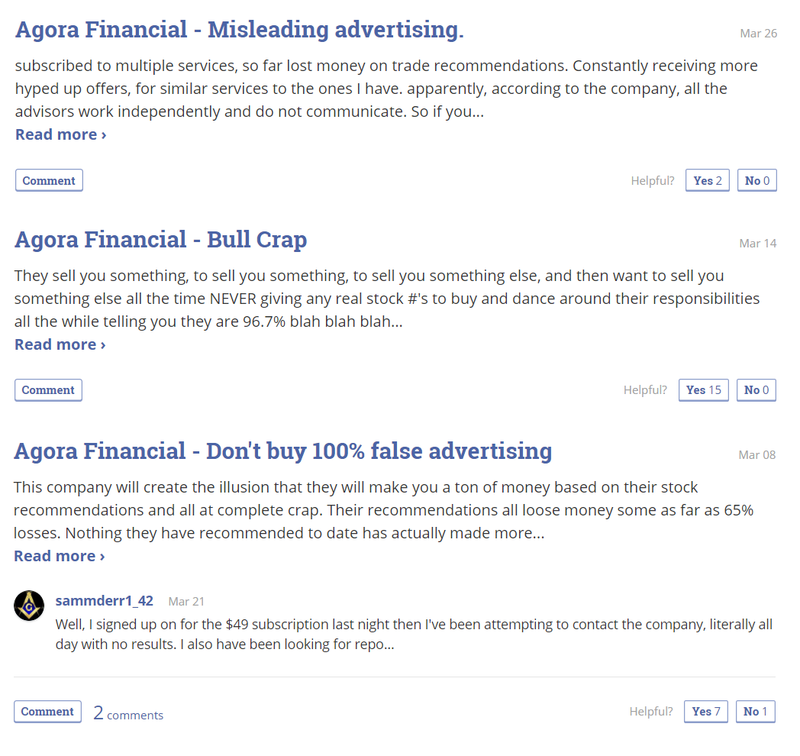 I have reviewed quite a few different publications from Agora Financial. Some of these include Real Wealth Strategist, True Momentum, Big Book of Income, and maybe some others.. I don’t remember. One very common theme I have found for all of these different newsletter products is that they are all promoted in a very misleading way. You will see all sorts of crazy sales pitches for their financial forecast newsletters. For example there is that the “Freedom Checks”sales pitch that makes people believe they are somehow going to get free checks from some private institution just for being a US citizen and writing their name down on some list, when in reality the entire sales pitch was part of a funnel to sucker people into buying the Real Wealth Strategist newsletter and these “freedom checks” that were being talked about so much or really just dividends that you could possibly get paid by following the newsletters investment advice. Or then there is the True Momentum newsletter that is advertised as providing investment advice that will grow your account “a minimum of 300% over the next 12 months”. And then there was the “This Magic Metal” sales pitch which was another funnel to buy into Real Wealth Strategist that lured people in by having them thinking they were getting investment advice on some “magic” metal that is going to be the investment of the millennium. And we can’t forget the “Big Book of Income” that has people thinking they are going to be making “$35 an hour walking on the beach” if they order this free book and pay shipping… But it’s really just a sneaky little ploy to subscribe people to the Lifetime Income Report newsletter. And there are plenty more where these came from. 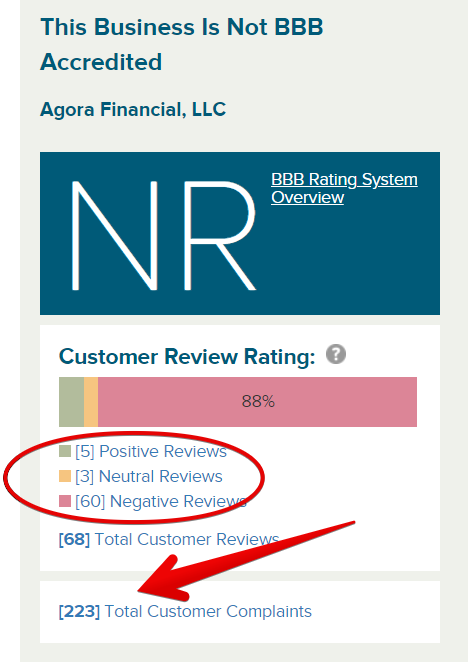 On the site Agora Financial has over 130 reviews (at the time I’m writing this) with a 1.5 out of five star rating. That’s pretty darn bad. 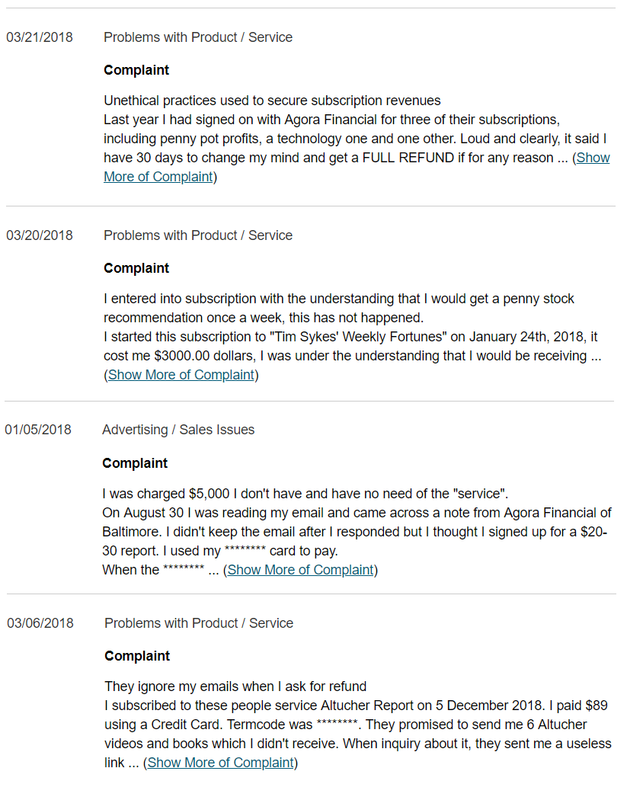 And as you can see below some of the top complaints on this site include misleading advertising, deceptive practices which is pretty much the same thing as misleading advertising, and poor customer service. Another common complaint that I have found on this company has to do with being overcharged for subscriptions. Apparently there are a fair number of people out there that have problems canceling their subscriptions and also get subscribed to newsletters without even knowing they are getting subscribed to them. Agora Financial seems to make it one heck of a hassle to cancel your darn subscription. Their customer service is absolutely atrocious and this often leads to customers seeking help in getting their refund from customer protection services such as the Better Business Bureau. You will find all sorts of complaints on this site about not being able to get refunds although the refund policy states that they should. The reason for this is because Agora Financial ignores refund requests from individuals. But then when individuals go and complain to places like the BBB they get their act together and will respond to refund requests. Ok… Misleading Advertising and Overcharging Customers…. But Does Their Financial Advice Work? From what I see the investment advice is somewhat of a hit or miss. I have read reviews from customers claiming that the advice given has led to them profiting, while I have read others complaining about losing money from listening to certain advice. Now of course this largely depends on where the advice is coming from, for example which newsletter you are subscribed to and who the editors are, and you also have to consider the fact that people are more willing to write negative reviews online than positive ones. But all in all my opinion of the many different investment advice newsletters published by Agora Financial is that, like I said, it’s somewhat of a hit or miss. Based on what I see I would say that the advice is decent, not great and not bad either. But when you answer this question you have to look at the advice as a whole. Some investments will lose and others will win. I really don’t know what the heck Agora Financial’s deal is. If they want to stay in business they need to get their act together. They seem to be in it for the money more than anything else and continually treat their customers like crap by suckering them into buying newsletters with misleading information, signing customers up for subscriptions that they don’t even realize they are getting signed up for, and making it really difficult to cancel subscriptions. There is a reason they have such a bad reputation in the financial world and this is it. Personally, I would never subscribe to a newsletter from Agora Financial. They seem to be in it pretty much solely for their own benefit and although there is good advice provided at times, nothing seems to be that spectacular. So for me the reward just isn’t worth it, but of course this is just my opinion and you may have one that differs. If you have a personal review of Agora Financial or a comment/question on anything please leave it below the end I will get back to you as soon as I can 🙂 I hope you enjoyed this review and I hope I gave you a better understanding of what the company is all about.